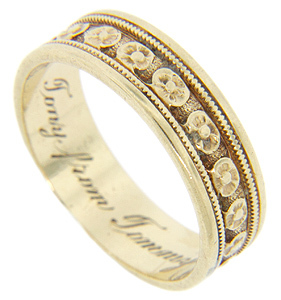 A repeating floral design spans the circumference of this 14K yellow gold vintage wedding band. The interior of the band is engraved “Tony from Tommy”. The wedding band measures 5.6mm in width. Circa: 1950. Size: 6 3/4. We can resize.